Dan Kennedy Certified Copywriter for Info-Marketers. Kennedy is one of the copywriters I follow very closely. Because, as a direct response copywriter, I've written extensively in this niche, I knew a lot of the material but I learned some fresh techniques. Never a bad thing. So...if you sell information and need a direct response copywriter...what's in this for you? You won't have to explain much, if anything, about the business. I get up to speed quickly and you don't have to spend hours explaining how everything works. I use the same info-marketing copywriting techniques as Dan Kennedy who is a pretty decent information marketer and copywriter. The course taught me how to help information marketers upsell, downsell, and generally increase revenue. I discovered the importance of providing a complete range of copywriting services to information marketers. So with me, you get a 'one stop shop' for all your information marketing copywriting needs. With my background in direct response copywriting and close to 20 years of experience in niche publishing, I believe I’m well positioned to help info-marketers sell information and write content that people will buy...time and time again. 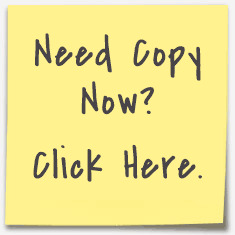 All the copy and content you need if you’re an info-marketer. I really enjoy writing for people who sell information. It’s a great business. Contact me here if you want to discuss a project or discuss your copy and content needs. And go here for free resources and checklists. Here’s the disclaimer I have to include.